Nature is simply amazing in terms of colours, shapes and fragrances. Vitosha mountain – 19 km long by 17 km wide – is the oldest nature park in the Balkans. It is a volcanic mountain massif, on the outskirts of Sofia, the capital of Bulgaria. As one of the symbols of Sofia it is excellent for sports such as hiking, alpinism, skiing or just walking in any season. Vitosha has the outlines of an enormous dome. The mountain emerged as a result of volcanic activity and has been subsequently shaped by the slow folding of the granite rock layers and a series of gradual uplifts of the area. The highest point of the mountain Cherni vrah is 2290 m and is one of 10 peaks of Vitosha over 2000 m in height. The name Vitosha comes from the two-peaked, twin ridge mountain, which rises above the Sofia field and has acquired its present shape in stages over many millennia. So one Sunday morning recently, inspired by several pink cones pictures, we started looking for such cones ourselves. We drove up to Aleko and from there we walked to Fizkulturnik hut. Aleko is the principal tourist sports centre on Vitosha, offering accommodation at Aleko Chalet (1820 m) and few hotels. There are several chairlifts, surface lifts and ski runs, cafeterias and restaurants, and ski and snowboard schools. The site is accessible by a 6.27 km gondola lift from Sofia’s suburb of Simeonovo, and by road from the suburb of Dragalevtsi. Aleko is also the starting point of a number of tourist tracks. So from there we took the road to Fizkulturnik hut. My personal FitBit device reported 7 km from Aleko to Fizkulturnik hut. Being a not very active tourist, I confirm that in addition to the incredible views, the itinerary is not difficult at all and it is easily walked within an hour and a half. Fizkulturnik hut is located next to Golyam Kupen peak. There you can relax and admire the breathtaking viewя that opens to Vitosha Mountain below and above, Rila to the south and Plana Mountain to the East. This is a great scenic route that I would recommend to everyone. And on the way there, we did come across pink cones. The name “cone” derives from the fact that the shape in some species resembles a geometric cone. The individual plates of a cone are known as scales. The male cone (microstrobilus or pollen cone) is structurally similar across all conifers, differing only in small ways (mostly in scale arrangement) from species to species. Extending out from a central axis are microsporophylls (modified leaves). 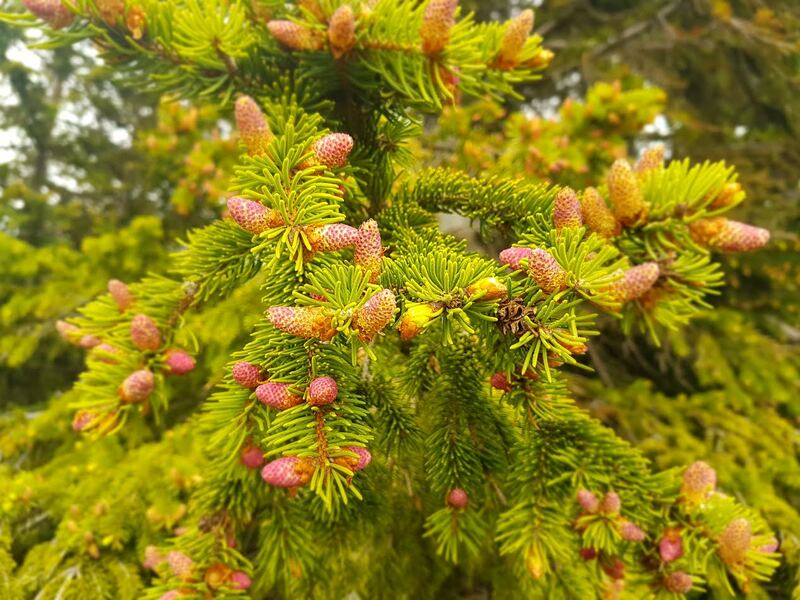 The pink cones are usually referred-to as immature male or pollen cones. Whatever they are called, they are a real delight to the eyes on amountain walk. Our day in 60 seconds 🙂 The music background I used in the video is from the song “You are beautiful, my forest”, a lyrical poem by Bulgarian author Lyuben Karavelov. It was written when the author was in emigration and reflects the nostalgia of the author to native nature. The composer Georgi Goranov wrote the music to the lyrics. The elegy is perceived as an unofficial anthem of the town of Koprivshtitsa and of the National Council of Bulgarian Folk Art.